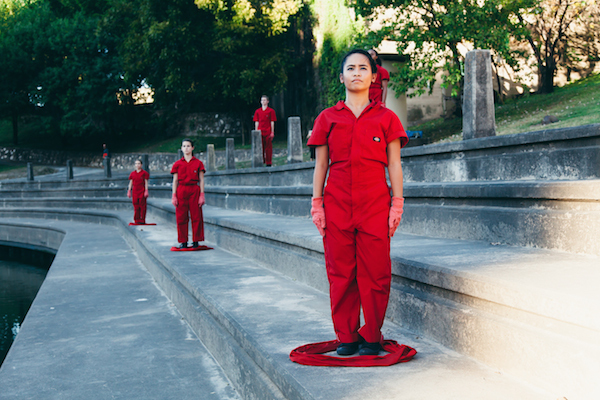 The tradition of organized al fresco art watching goes all the way back to the ancient Greek prosceniums but on October 18, choreographer Karen Stokes staged an outdoor site-specific work that could have only have happened here in Houston. Stokes’ Sunset at White Oak transformed Allen’s Landing, a little known alcove of a location in the north of downtown, into an self-made amphitheater with the surrounding urban cityscape as the backdrop. It was exciting to see the hill next to the Willow Street Pump House filled with spectators, students, and supporters of Houston dance, as well of the city itself. Sunset was not simply dance superimposed on a site, but a meditative, enlightening study of the location’s history, mythology, and spirit. Allen’s Landing, now nestled between the buildings of the University of Houston-Downtown, is a nexus of the city’s core. It’s the site of the original Port of Houston, the meeting point of the White Oak Bayou and Buffalo Bayo, and can be accessed by transportation of all varieties from every direction. Allen’s Landing isn’t just a picturesque backdrop to witness a sunset, but is the ideal canvass for Stokes’ mediation of where the city has been, where it’s at, and where it might go. Sunset began with members of Karen Stokes Dance descending from the Willow Street Pump House in a solemn processional to original music by Brad Sayles. Performed by Heights 5 Brass, Sayles’ music has a rustic, old world sensibility that is also industrial, utilitarian, and modern. 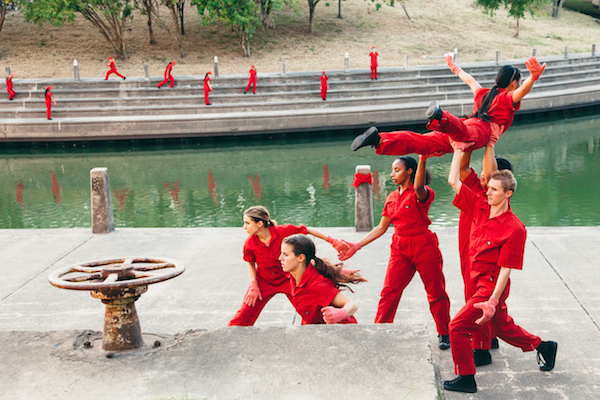 The formality of the accompaniment suits the costuming choice, which saw the performers in red jumpsuits that suggest the labor and ingenuity needed to develop the swampland that Houston was built on. As the dancers lined the esplanade facing the water, one has to wonder what the Allen Brothers saw when they originally surveyed the bayou back in 1836. The most significant quality of Sunset is Stokes’ intelligent sense of space and composition. While the KSD company performed directly in front of the hillside audience, members of the University of Houston’s dance ensemble populated the background, namely the overpass connecting UH-D’s campus and the walkway on the opposite side of the bayou. The smart interplay between foreground and background created the impression of a grand-scale canvass on which Stokes was able to work her choreography. And what choreography it is. Like Sayles’ music and Stokes’ choice of costumes, her choreography is completely utilitarian. There are no ornamental flourishes, and no excess maneuvers to fill in the quiet of the music and the site itself. Every step in this dance seemed to be essential, deliberate, and completely necessary. The movement is strong and weighted, but tempered with bits of humanity. 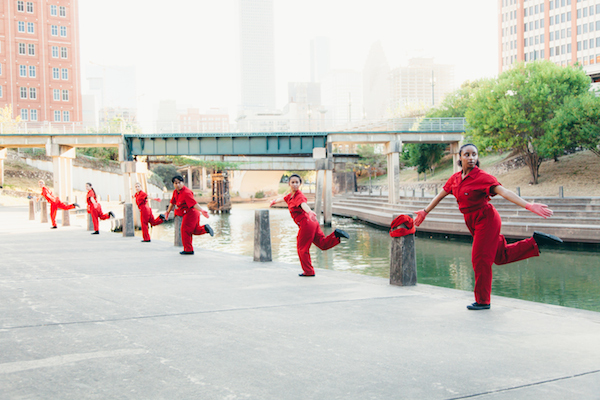 Though the dancers embody the industrial spirit of Houston’s founders, like the Allen brothers, they are not cogs in a machine, but bodies with human character. In Stokes’ weight shifts, gestures, and partnering, I found there to be an undercurrent of innate comedy. This would be appropriate, as the founding of Houston is rife with humor. Settlers came to the city in droves on the false claims that Houston was an undiscovered paradise filled with entrepreneurial possibilities. What most found was swampland and mosquitoes. While the dancing does make use of some of the area’s architectural features, I found the most compelling part of this site-specific work was the commitment to the intention of the project by the dancers. If Stokes is trying to embody key features of the city through movement, then her company certainly accomplished that. Unencumbered by the heavy costumes, they moved with force, boldness, and a clever sense of timing. Sunset at White Oak ends how it started, with a sun salutation that serves as a tribute to Allen’s Landing and all of its possibilities. It’s doubtful that the Allen Brothers knew that their small development would become the birthplace of the fourth-largest city of the United States. And as expansive as the city is today, it’s hard to imagine that it all began at this postcard pretty location. While this site-specific work certainly brings attention to this little known piece of the city’s history, I would say it’s greatest accomplishment is capturing the spirit of Houston, a testament of the wondrous possibilities that can come out of a little imagination.